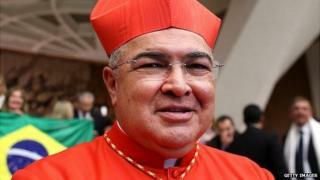 The archbishop of Rio de Janeiro in Brazil has had his crucifix and ring stolen in an armed robbery. Cardinal Dom Orani Tempesta was on his way to an engagement in the city when his car was ambushed by three men. One of the robbers, who pointed a gun at the cardinal, realised who he was and apologised, an aide said. However, the gang continued with the crime only holding back from taking his vehicle as well. The cardinal's items were later recovered. No-one was hurt in the incident, which happened on Monday evening in the Santa Teresa district of the city. The BBC's Gary Duffy in Sao Paulo says robberies are common in Santa Teresa - a bohemian area popular with tourists - and have been increasing this year. A seminary student and a photographer travelling in the car with the cardinal were also robbed. Despite the ordeal, the cardinal continued on to his engagement while the student and the photographer went to the police. Brazil's TV Globo says that the thieves abandoned most of the stolen property, which was later recovered. The ring and the cross were found, as were the archbishop's mobile phone and the seminarian's cassock. However, the photographer's equipment is still missing. Dom Orani Tempesta was made a cardinal by Pope Francis earlier this year.